There was a set of trading figures that came out in 2006 which featured figures of 00, 01 and 02 in Type-F configurations. This is the only place I have ever seen the Type-F Eva-02. I was psyched to see Type-F 00 show up in Anima, though. I actually own two sets of these figures - I bought a second set because it included the alternate (or 'anime color') versions of the figures - 00 is blue, 02's F-equipment is a brighter red to match its main body and if I'm recalling correctly there is pretty minimal difference on 01 - I think it might have a few more green highlights, or the purple on the Type-F gear is closer to that of its main body. There are 'alternate' versions of the girls as well - a lazy swap, packaging Rei's head with Asuka's body and vice versa. Hyper Shinchan: Does your PSP guidebook have any info on what's the deal with Shinji's Scenario 18? 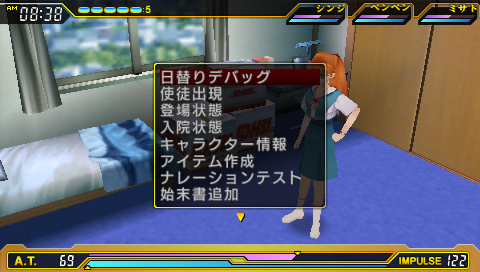 It starts with Asuka in her Nerv sickroom and everyone (including Kaworu) depressed/bad mood. 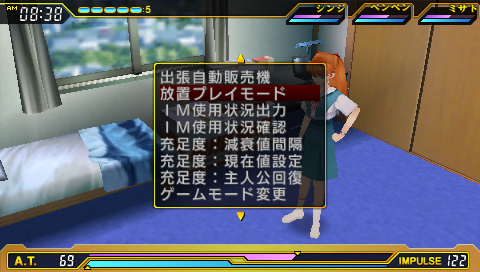 As proper game play (to clear it) goes on, Touji dies. Then Shinji from heat stroke sees Pen Pen talking. The cleared good end is an Instrumenality one (I think "Oyasumi Nasai"? ), nothing unique for the Scenario. I just don't get it! ^ apparently it doesn't say much about it. The event list gives only a single event, the initial sequence (it's always listed as an "event" for every scenario), there's nothing else so it's completely possible that there's no unique ending for this scenario; it's also possible that PenPen monologue isn't exclusive of this scenario but it only happens easily in this one because everyone is super-depressed (in my case only Kaworu was fine but he became depressed as well after Touji's departure). I can't really understand much of the text, so I'll try to scan those mere two pages later today or tomorrow, but unfortunately I'm not very good at doing it as you may remember. The scans are pretty rough (read: bad) but they're completely readable, for now they should do just fine since I have a cheap scanner; anyway I should read some scanning tutorial, I'm interested in improving my limited skills, does anyone have any link? At least both Sega games are balanced and in-character, and of course, Eva 2 does a mostly decent job of in-character balance for the endings as well. 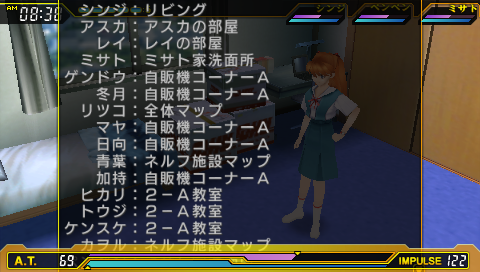 I do find it weird how the PSP's Best End for Angel Attack makes no mention of Asuka--but we see Shinji and Rei talking together. -.- Sad how Kaji and Misato are both dead but everybody else lives and 3I's averted. Sailor Star Dust wrote: At least both Sega games are balanced and in-character, and of course, Eva 2 does a mostly decent job of in-character balance for the endings as well. Yeah, but somehow I've the feeling that the first Sega game was really limited and a little awkward, they did an excellent job with the second one. NGE2 is obviously great and well balanced, it has so many routes after all, some scenarios are really particular (recently I was thinking about Touji's one) but it's surely worth seeing all of them. I really remember little of the first scenario, I never re-played it (I should do so), I think that Asuka was also absent in the ending of the second scenario. Sailor Star Dust wrote: Sad how Kaji and Misato are both dead but everybody else lives and 3I's averted. Well, Kaji and Misato's dead is indeed sad but actually many scenarios are somehow sad, for example you kinda shocked me when you explained me what happened with Rei in her scenario. Not to dreg up an ancient thread, but what ever happened to that menu patch you guys were talking about. I recently found this game gathering dust on my shelf and was thinking about playing it, though sloshing through Japanese menus doesn't sound all that appealing to me. Well, I tried to send a PM to the guy who was apparently capable of hacking the game but I still haven't received an answer. Anyway, I casually found this short interview to Anno about Evangelion 2, has it been already posted/discussed in the past? It seems to be a promotional video for the original release of the game but honestly I understood little or nothing of it. It was in December Newtype (Japan) 2003, apparently. Don't believe I've seen this interview before. If there was a transcript I could follow along more. The only thing I really got the gist of is how the game is an open-ended world with Tokyo-3 and Anno hopes people enjoy the game. Sailor Star Dust wrote: It was in December Newtype (Japan) 2003, apparently. Yeah, it looks like it comes from a DVD included as extra of that Newtype issue, which came out on the same month of Evangelion 2 PS2 release. Unfortunately I can't find a transcript, anyway there's also an interview to the director Yuri Shibamura. Don't believe I posted these before, but this is just a nifty little resource for the Eva2 fans out there. 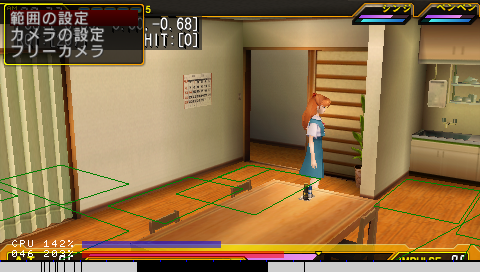 From the PS2 Eva2 version but at least two scenery images are from the PSP Eva2 game. Thanks a lot for sharing it, I appreciate it! 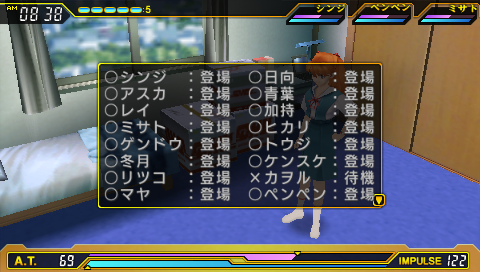 I don't see any "Kaworu blush" screenshot, is this a partial collection made while progressing in the game? 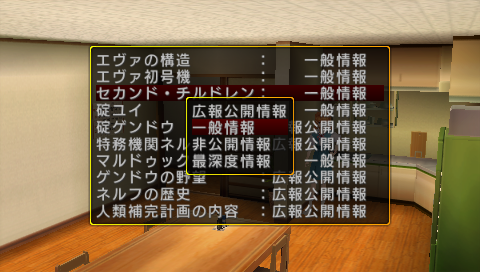 Or is it simply absent in the PS2 version? 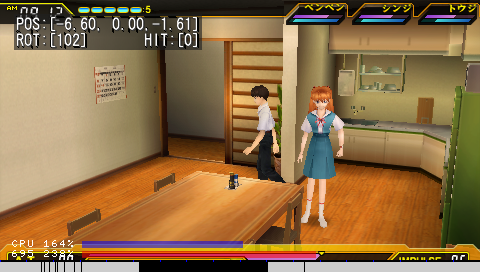 I'm not familiar with the PS2 version but I clearly remember that there's a blushing Kaworu in the PSP one. Actually I've been searching for some program capable of extracting NGE2's graphics lately but I couldn't find anything so far, Westside offers several similar tools for other games but unfortunately they didn't make anything for Evangelion 2. Hyper Shinchan wrote: I don't see any "Kaworu blush" screenshot, is this a partial collection made while progressing in the game? It was a partial collection made, yeah. There's probably Kaworu blushing in PS2, I just don't remember. Sorry [s:12xtg76j]not sorry[/s:12xtg76j] for bringing this topic back from the limbo, but I'm now playing Touji's scenario (PSP) and there was a scene in which he and Ritsuko talked about his little sister's health, and she kept mentioning a 'donor'. My moonspeak/moonrunes skills are sadly very limited, so I was wondering if anyone knew what's the poor girl's condition. I automatically assumed 'donor' had to do with a transplant, but I may be wrong. Also, FWIW, I got Asuka's best ending on my first playthrough, and the funny thing was that the Leliel battle was right after the Israfel one. Lucky me. 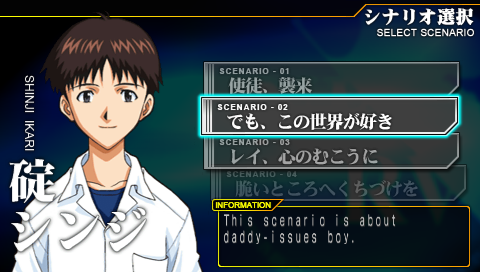 Actually, Asuka's scenario was chock-full of funny things, including a reverse EoE Harpies scene: apparently persuading Kaworu to join the Lilim took a lot out of Shinji, as he spent the remained of the game in hospital until Nerv was invaded and Misato had him put inside Unit-01. Then he 'woke up' just in time to give Asuka a hand in fighting the Eva Series. Lastly, how do you unlock Shinji's Scenario 18? Just be all buddy-buddy with him with another character? Clear all the other scenarios? I can't seem to remember it being mentioned here or in Lleonard Pler's walkthrough. Ambrosia wrote: Lastly, how do you unlock Shinji's Scenario 18? Just be all buddy-buddy with him with another character? Clear all the other scenarios? I can't seem to remember it being mentioned here or in Lleonard Pler's walkthrough. Waa, so sorry this is such a late reply. I love this game so I never tire of discussing it (though I haven't played it recently). I believe you have to clear all other Scenarios in order to get Scenario 18 unlocked. 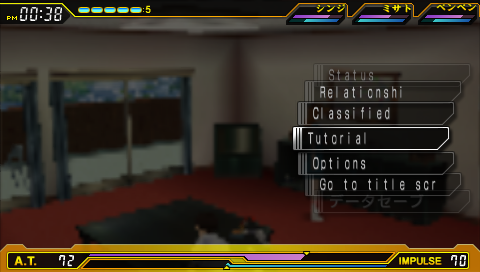 Though a quick and easy way of Scenario unlocking is to be buddy-buddy with other characters to unlock their Scenarios. Say you want to get Asuka's scenario, you have a high relationship with her, then when you get a game over or clear your Scenario, her Scenario should be there. 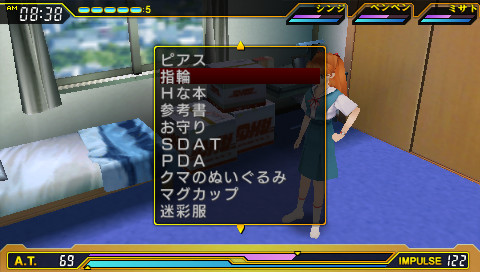 Never crossed my mind earlier, but I have the save data (all 18 character Scenarios cleared and 14 convenience store secret items available) for those who want whichever character to select. The old 18 Scenario unlocked file here seems broken, last I checked a few years back. 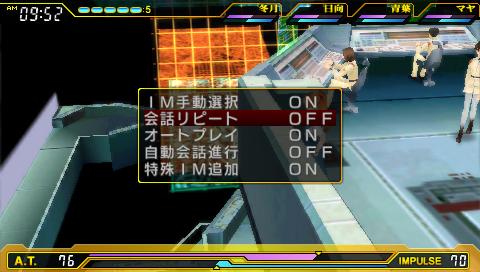 I still never figured out how to get the F-type equipment on Eva-01/etc. 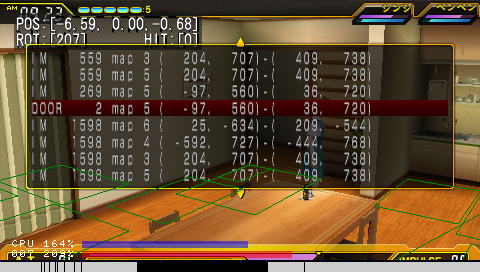 Adding the save data to the PSP should be easy enough, consult . but I couldn't find any tangible leads. Player position and orientation information. At the bottom are two other separate displays for CPU usage and memory allocation. I assume it shows where the transition locations are in the map / activity locations? 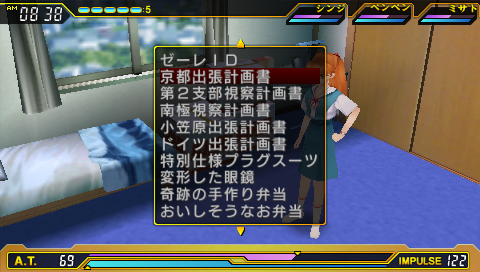 it has some side effects like causing the game to freeze in the background. until I figure out the proper entry point. I'm aware the options have to do something with the camera. They're in the application code most likely, hard-coded. I hate when they do this. Bunch of stuff in the application code, and a bunch of stuff split off into files. 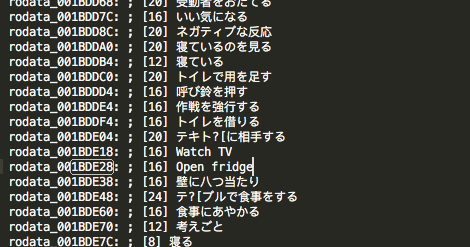 There's about 4400 "lines" of Japanese. but first I'd like to get things translated so that it's purposely cut off if it can't fit. 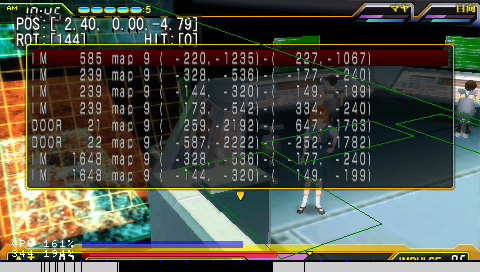 Then after that, tackle re-arranging the data to be able to fit it all. Looks to allow one to teleport / give oneself any item in the game. I can't follow most of the technical side of matters. 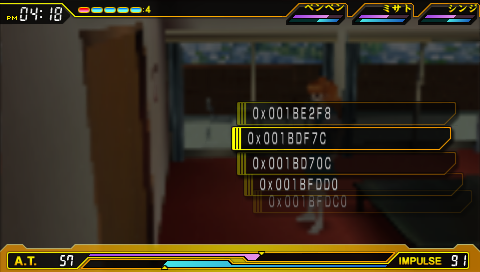 Have you basically figured out how to patch the PSP game into English? You didn't say anything about translating cut scenes, so does that mean you haven't found where the dialogue is stored yet, or...? If this is seriously going to happen, I would love to lend my assistance to the process. My availability may be somewhat iffy until next month, though, just as a head's up. Reichu wrote: I can't follow most of the technical side of matters. 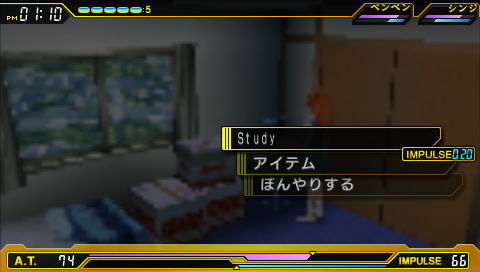 Have you basically figured out how to patch the PSP game into English? You didn't say anything about translating cut scenes, so does that mean you haven't found where the dialogue is stored yet, or...? The dialog is stored in another file which I've not yet looked into. 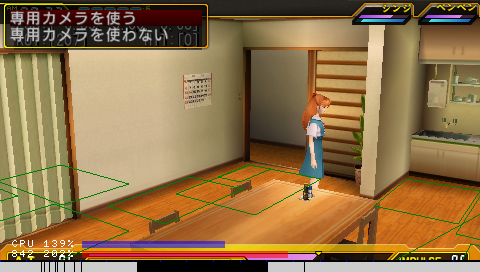 This is mainly the menu and low-level choices/dialog ("X is knocking on door; let them in! "), which, is still a sufficient chunk of the game. Later today I plan to open up a GitHub account to host the project. 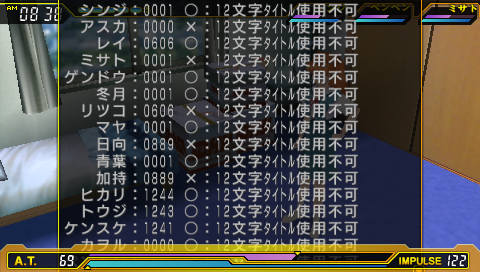 In other news I made some cheats after Pulse mode ticked me off. It's so gratifying seeing it auto win. As for frame-skip, it's a hidden feature in the game. The cheat just exposes it. No need to change the size or anything, just the ?? ?